There’s no denying Colorado’s land locked situation. My Man is from New England – he grew up in Massachusetts for much of his life and spent every summer on the coast of Maine. He’s a seafood snob and often laments about the lack of ocean in Boulder. Well, except when we go to Jax in Boulder. He gets a little taste of the salty air and fresh seafood and he is at culinary ease (for the moment, at least). Jax Fish House in Boulder is one of the longtime favorite seafood restaurant in Colorado from Big Red F (with location in Fort Collins and Denver). Every March they host Oyster Month and they have been doing so since 1997. Since we’re in the midst of this annual celebration, we had the chance to connect with Jax’s own, Max Seid their oyster ambassador and a three-time competitor in the Boston shucking competition. He throws down when it comes to oysters and he has shared little known facts on oysters from shucking to the amount of oysters one could eat in a sitting! How long does it take to shuck an oyster? It only takes a few seconds to shuck an oyster. There are two parts. Opening the oyster and removing the top shell, and then cleaning and plating the oyster. More time is spent on the presentation than the act of opening it. Is there a top of the line oyster shucking knife? To each their own. I use a long knife with a finer tip. Others may choose to use a shorter knife with a wider blade. The great thing about having traveled to multiple seafood shows and oyster festivals is that you get to see everyones knife of choice. A lot of shuckers make their own blades. I haven’t taken it to that level yet. How do you tell quickly if an oyster is bad? For starters, a bad oyster can smell pretty bad. One bad oyster can really stink up an entire bar. Aside from whatever smell may come from the oyster, I can tell just by the looks if I feel comfortable serving it or not. After shucking oysters for a few years now you can set apart the good from the bad pretty easily. Have you ever participated in an oyster shucking competition and how did you fare? I’ve competed in four competitions now. I’ve done the Boston International Seafood Show for the past three years and one competition in Maine. I’ve taken 5th place in Boston and 3rd in Maine. One of our fellow shuckers at Jax, Ben Wolven, actually won the competition we attended in Maine and is officially declared the Maine State Champion. How many oysters do you think you can eat in one sitting? Ha. A lot. But for enjoyment, not for time. Hat goes off to all of the contestants in the oyster eating competition this year. No way I could do that. 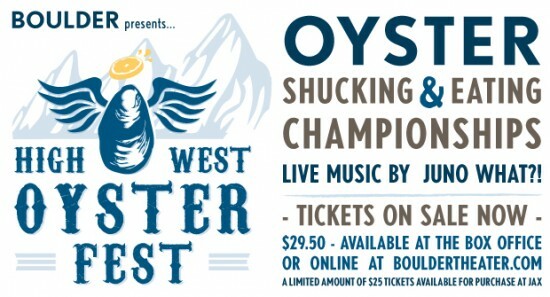 Now that you’ve been well versed in the world of all things oysters, this celebration culminates on April 2nd with the High West Oyster Fest at The Boulder Theater. This festival will include live music from JUNO WHAT? !, an oyster raw bar paired with Odell’s Emersum Oyster Stout, an oyster eating contest (most mollusks in 90 seconds, cash prize) and an oyster shucking championship. One of the greatest parts? All of the proceeds benefit Veterans Expeditions, a Colorado based non-profit that uses wilderness challenges to reconnect veterans, raise awareness and reintegrate veterans into society. Tickets are only $29.50 and you can buy them at the Boulder Theater Box Office or online at bouldertheater.com. If you’re feeling fancy, there are some VIP tickets available at all three Jax locations. Doors open at 6 PM. You can learn more about the Oyster Festival here.